How to Create IVR Through Web based Designer? 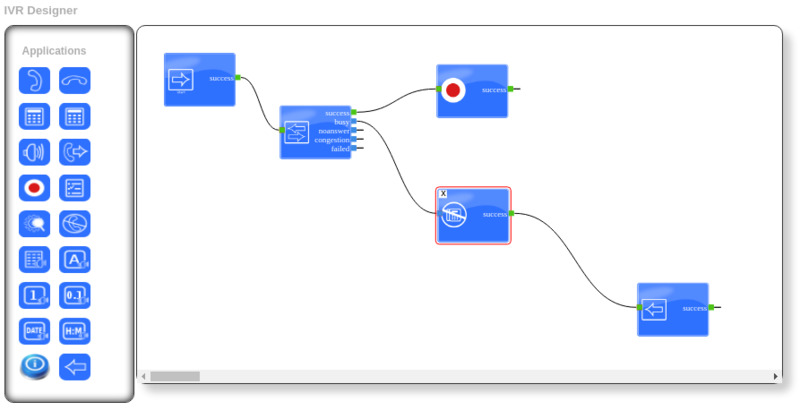 ICTBroadcast Service Provider Edition bundles with an IVR Designer Tool. 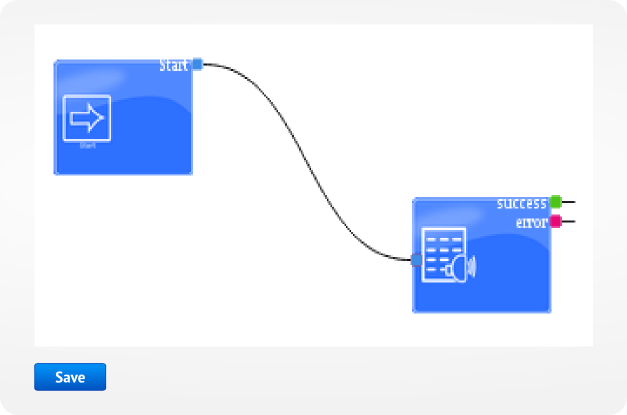 IVR Designer is an interactive web-based software tool that allows you to create advanced telephony systems with a simple drag-and-drop interface. The user can pick any application from the toolbar area, then drag it to the main drawing area and drop it. This will create that application at the dropped location. 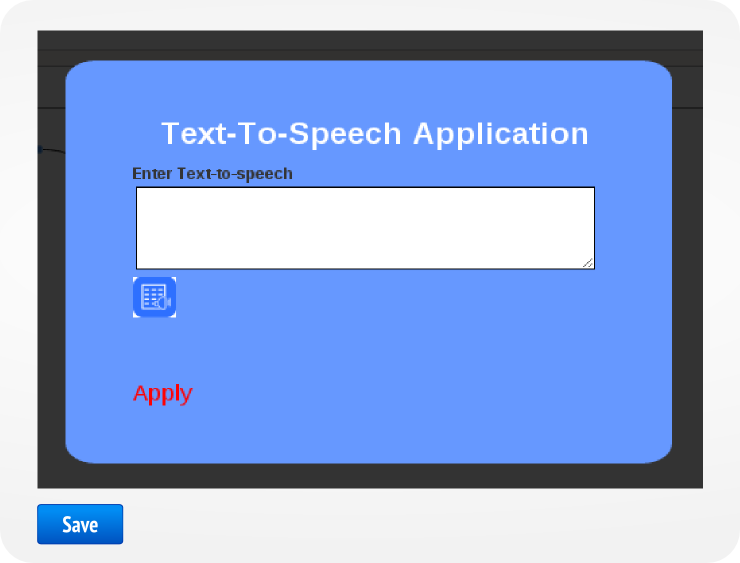 Its drag-and-drop interface makes it easy for users to create voice response applications in a web browser. 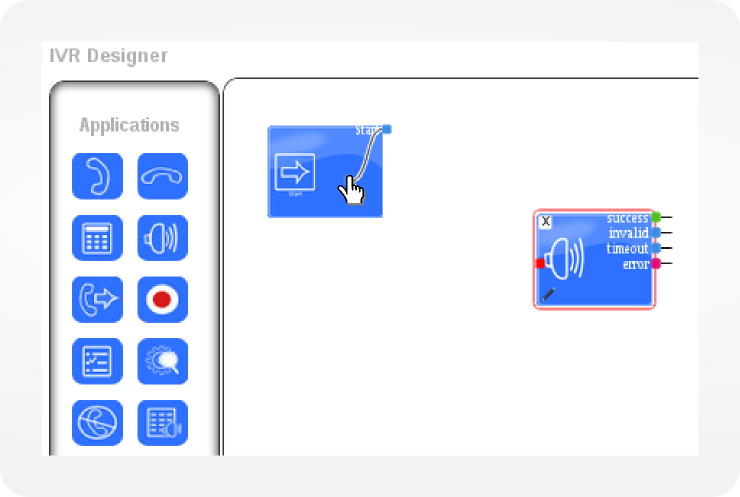 IVR Designer's toolbar contains the applications to create an IVR. Following is a brief description of each of those application. Call answer application answers an incoming call. However, IVR Designer does not handle inbound scenario in ICTBroadcast. So consider it non-functional in outbound dialer. Start application will behave as answered call in case of outbound call. Hangup application forces a call to be disconnected. Get any input request from your IVR. Plays a sound file. 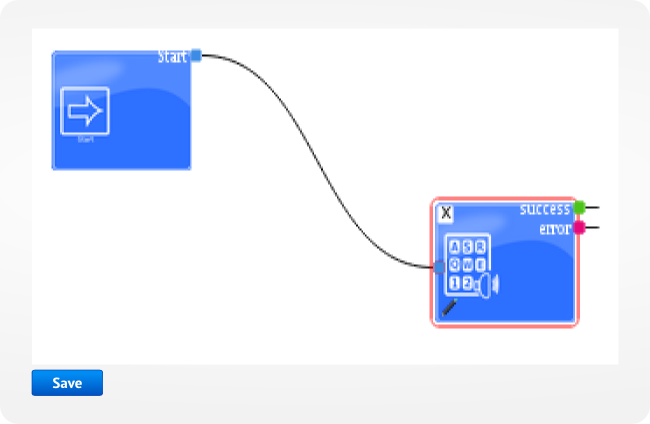 You can use a sound files from Recording section in the settings area. The Transfer application connects the active call to a specified phone number of an agent. This number is referred as Extension number in ICTBroadcast. The Record application can either create a recording, which starts with a beep and ends with the user pressing pound, or it can record the remainder of the call. Options Menus are used to gather keypad input from the user. 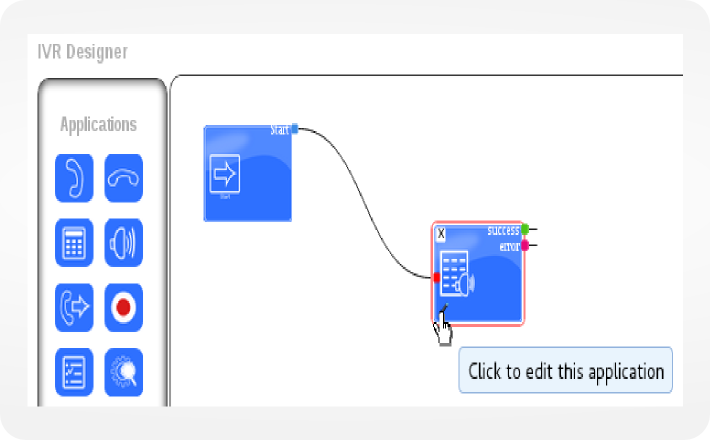 Each menu node requires at least one "Play" node to present options to the user, and one or more "Key Press" nodes to handle the incoming key presses. It detects after answering of a call whether it is Human or Machine. Then on the basis of this decision, user can perform any action. DNC Application adds a number to DNC list. 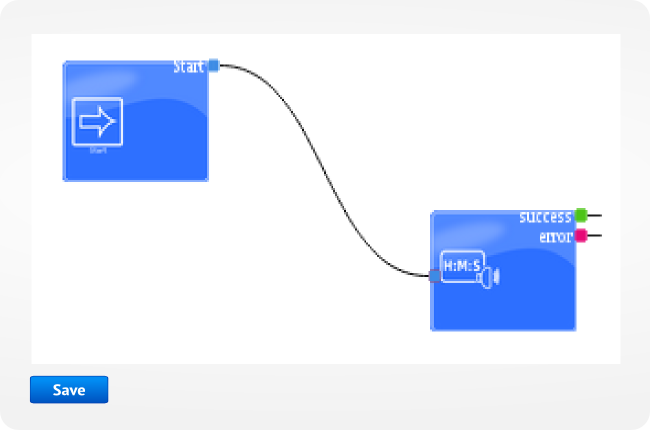 TTS application allows user to enter text that will be played as sound. IVR Application: A unique IVR element within IVR Desinger containing a specific function. E.g. Play Audio plays .wav recording. Call Hangup will disconnect the call. IVR (or IVRs): A complete IVR that contains one or more IVR Applications (elements) linked together. It is saved as a record, can be edited later and is available to be attached to a campaign. Navigate to Messages => IVR => New IVR. 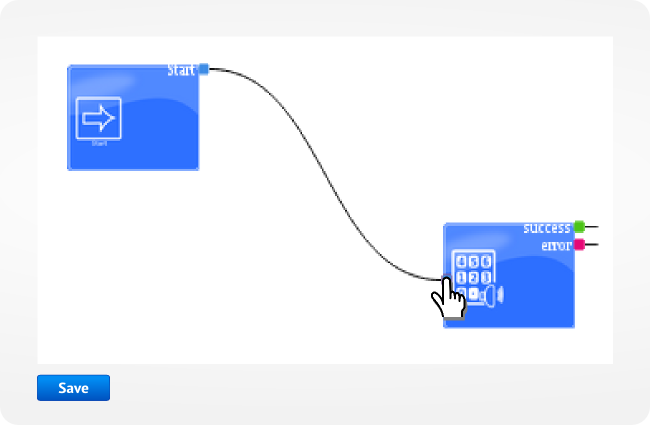 Drag and Drop Applications from toolbar area to the drawing area. To Link one Application to other Applications, move the pointer to small rectangle at top left of Application. Press and hold down the button on the mouse. Drag and Drop it over other Application by releasing the button. To Remove link, Select the destination pointer of link that user wanted to remove. Drag it the source Application and drop it over the source Application. To set Application settings, click on the small pencil at the bottom left of the Application. This will open a popup window. Every Application has different parameters settings. In the example below, TTS application properties popup is shown. 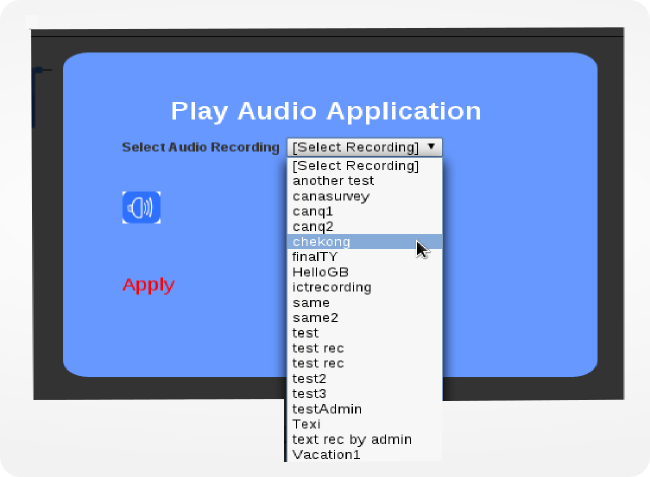 How to use Play Audio Application in IVR? 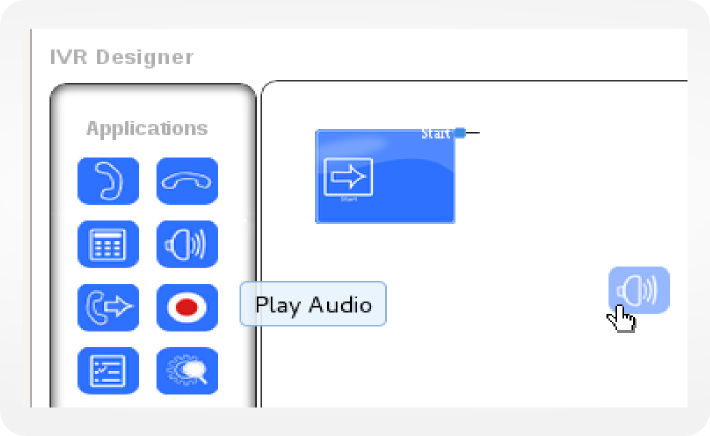 Create New IVR => Drag and Drop Play Audio Application to Drawing Area. 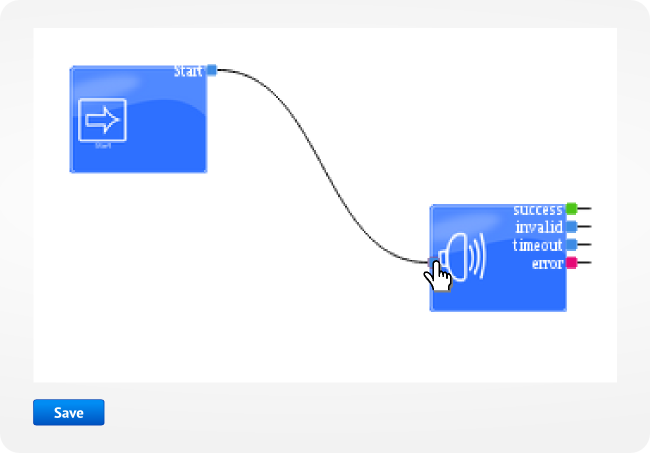 From popup window of Play Audio Applications. Select the required recording from drop down menu and Click Apply to save. 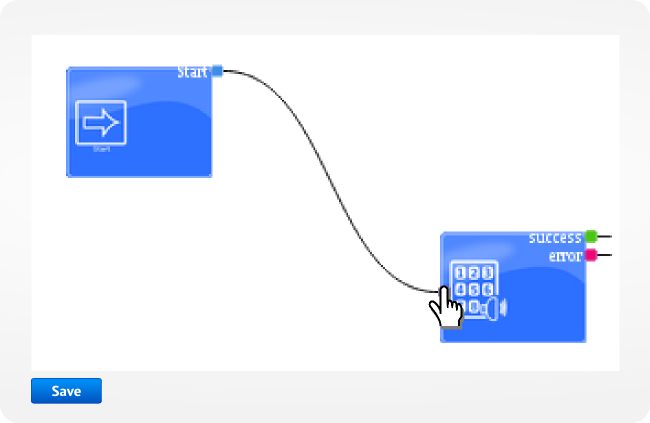 Link start Application with the Play Audio Application by dragging and dropping "Start Application" link on the "Play Audio Application". Click Save button on page menu to save this IVR. 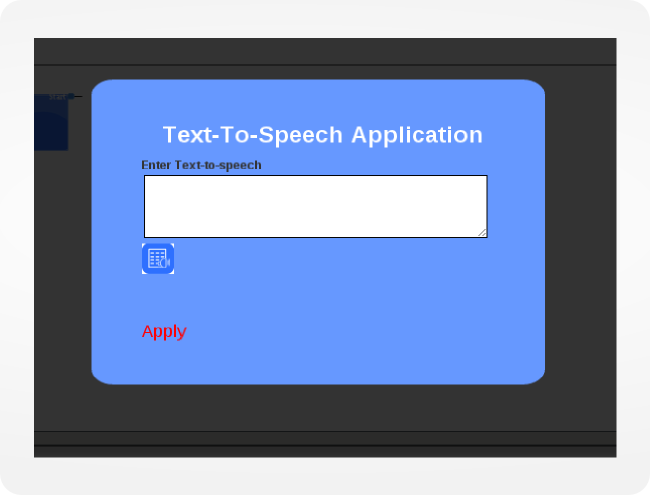 How to use Text to Speech (TTS) Application in IVR? 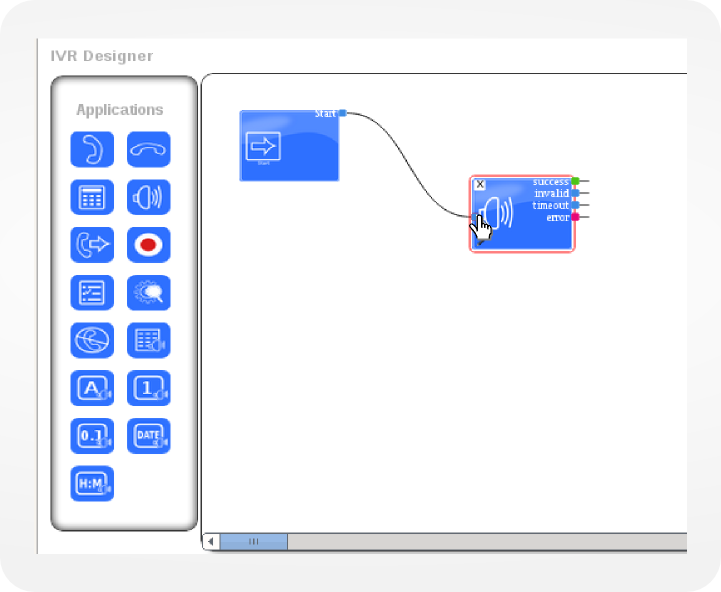 Create New IVR => Drag and drop TTS Application to Drawing Area. In popup window, write the text that user want to play, and then click apply to save. Link start Application with the TTS Application by dragging and dropping "Start Application" link on the "TTS Application". Click Save button on page menu to save this IVR. How to use SayAlpha Application in IVR? Create New IVR => Drag and drop SayAlpha Application to Drawing Area. From the popup window, user can select predefixed variables whose value will be played by this application. User can also select custom from dropdown menu. This will allow user to write alpha numeric value in the text box. Link start Application with the SayAlpha Application by dragging and dropping "Start Application" link on the "SayAlpha Application". Click Save button on page menu to save this IVR. 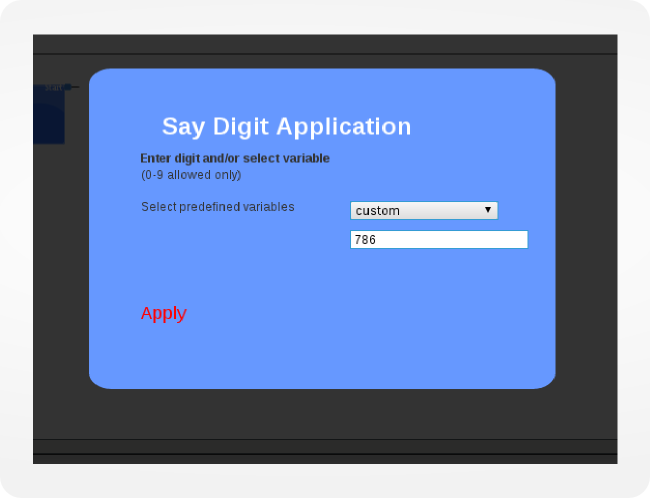 How to use SayDigit Application in IVR? 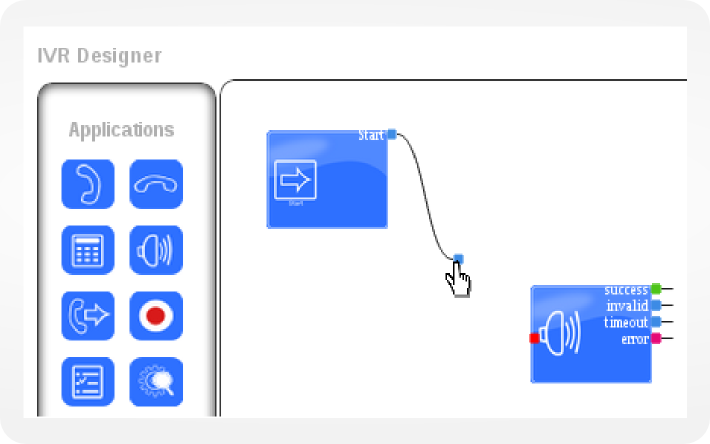 Create New IVR => Drag and drop SayDigit Application to Drawing Area. 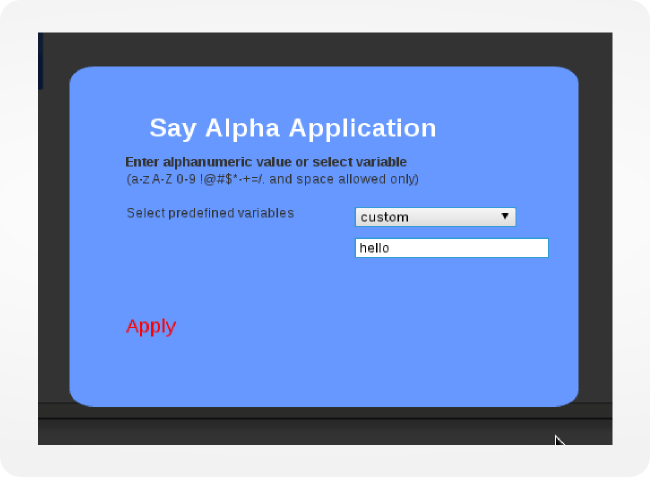 From popup window, user can select predefined variables who value will be played by this application. User can also select customer option from dropdown menu. This will allow user to write only digits ( 0 - 9 ) in the text box. Click Apply to save. Link start Application with the SayDigit Application by dragging and dropping "Start Application" link on the "SayDigit Application". Click Save button on page menu to save this IVR. How to use SayNumber Application in IVR? 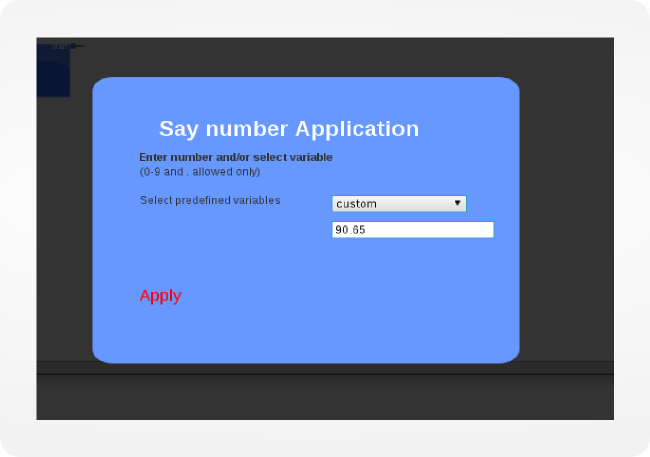 Create New IVR => Drag and drop SayNumber Application to Drawing Area. From the popup window, user can select predefined variables whose value will be played by this application. User can also select custom from dropdown menu. This will allow user to write only number (0 - 9 and " . ") in the text box. Click Apply to save. Link start Application with the SayNumber Application by dragging and dropping "Start Application" link on the "SayNumber Application". Click Save button on page menu to save this IVR. How to use SayDate Application in IVR? 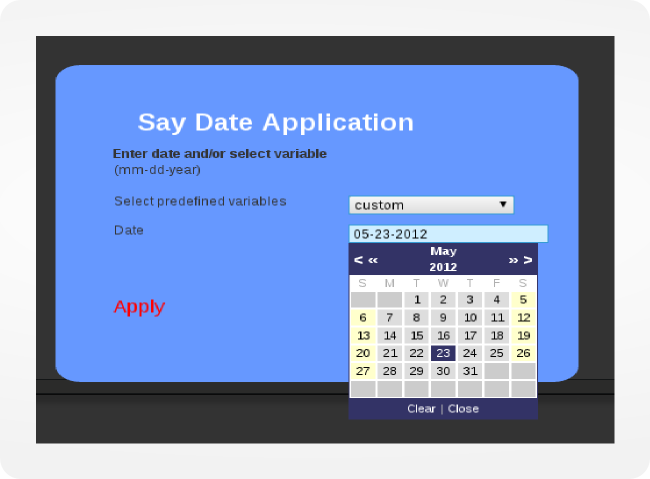 Create New IVR => Drag and drop SayDate Application to Drawing Area. From the popup window, user can select predefined variables whose value will be played by this application. User can also select custom from dropdown menu. This will allow user to Select time ( mm:dd:year ) from the given feild below. Click Apply to save. 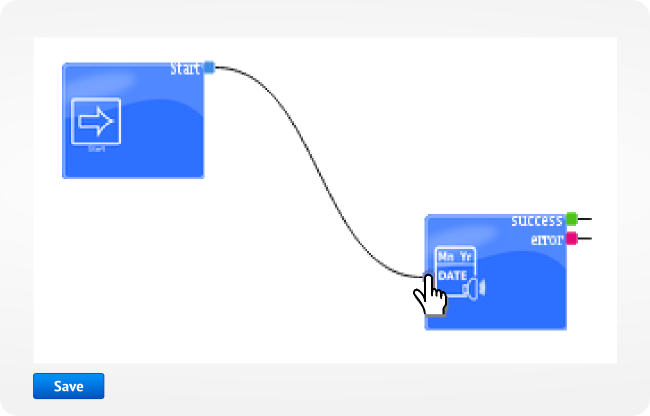 Link start Application with the SayDate Application by dragging and dropping "Start Application" link on the "SayDate Application". Click Save button on page menu to save this IVR. How to use SayTime Application in IVR? 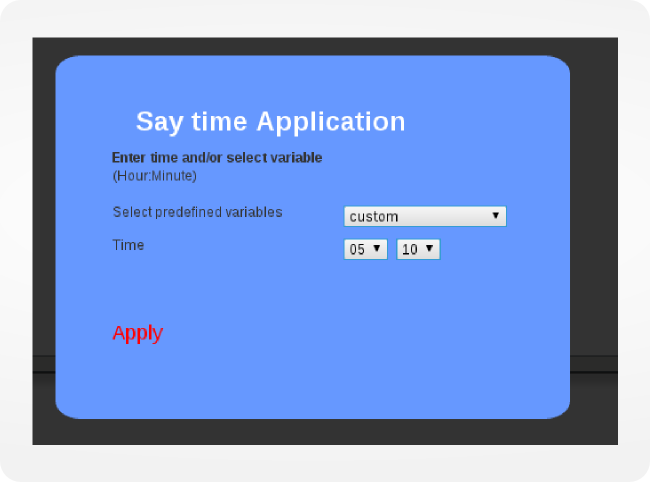 Create New IVR => Drag and drop SayTime Application to Drawing Area. From the popup window, user can select predefined variables whose value will be played by this application. User can also select custom from dropdown menu. This will allow user to Select time ( Hour: Minute ) from the given feild below. Click Apply to save. Link start Application with the SayTime Application by dragging and dropping "Start Application" link on the "SayTime Application". Click Save button on page menu to save this IVR. In IVR Designer URL option is given for integrating IVR with a third party software. You have created an IVR and you want when user presses any digit ICTBroadcast should invoke any third party API and should take an action on another software then you require integration of IVR with an other software and this feature in IVR will assist you well. In URL field API is mentioned during the integration process. When the user presses a digit, ICTBroadcast calls API that was saved earlier, and proceeds further. Url feature in IVR Designer is a step towards automation and it can help your business grow. This campaign is beneficial for many businesses especially the companies that provide some services to its customers and some kind of subscription is required in the process like cellular network companies.